Plate, part of a nine-piece setting, "St. Tropez" pattern. Colorless hand-blown glass, with hand-cut and hand-engraved decoration. Circular shape. Cut decoration consists of diagonal straight lines forming large diamonds around border of plate, the over-all resembling a star. At top of each diamond is an engraved circle. 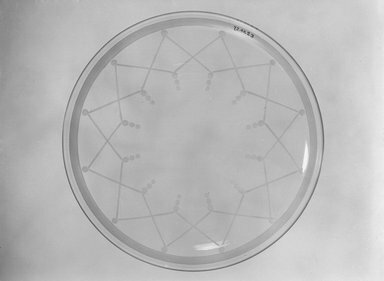 Three graduated engraved circles suspended from the bottom of each diamond toward the center of plate. Broad engraved band going around the edge of plate above the diamonds. Condition: Scratch at center of plate, otherwise excellent.